Shine complete acceptance & appreciation on ALL Beings. To create a World of Unity & Harmony we must practice completely accepting and appreciating everyone and all beings, including ourselves. Our differences are simply differences, and each person is learning a different lesson in life, therefore, our paths will be different. Being kind, compassionate, loving & gentle with acceptance and appreciation for the differences in all people & situations helps radiate the Peace each and every creature has as our Divine Right. Nonviolence, or Ahimsa, is one of the principles of yoga. A better definition of “Ahimsa” is loving compassion towards all living beings, harming no one and no other Beings including ourselves. To practice Ahimsa it is very important to learn how to not be violent towards ourselves. To do this, we need to focus on changing our thoughts, words and actions towards ourselves into loving kindness & compassion. Showing ourselves this love means to fully accept and appreciate ourselves, with our supposed “flaws” and all. When we think or speak poorly of how we look or perhaps say “that was stupid” to ourselves to a comment we have made, it is violence against ourselves. Therefore, we must correct it by canceling the thought and be loving & compassionate to ourselves, working towards changing our thoughts & words. Remember, our bodies are listening to us, and take the energy in, as well as sending it out. What we send out comes back to us – The Law of Attraction. So, focus on sending out what is good, positive & healthy for everyone, including ourselves. Remember, we are a human manifestation of the Divine, which is pure love & light, therefore, we are also pure love & light. Our souls have intended to live this life, as a human being. We are here for a reason, as is every other living creature. To learn lessons and transform, awaken and evolve. It is important to note, a Human Being is simply one type of life form on this planet, so we must make a note to treat all living beings with Ahimsa. Animals, insects, plants, water, etc, are all life forms and Beings with energy to which we can also show loving kindness & compassion, practicing Ahimsa. If we are cursing the weather, this is violence towards Mother Nature. Learn to accept the weather may not be what you would prefer. Acceptance doesn’t mean you like something, it means you understand it is something that is necessary and simply exists in this now. Practicing Ahimsa is also completely understanding Unity and how we are all intricately interconnected to one another and all Beings, thus the concept we are all One. It is knowing your neighbor, friends & family, animals and the elements share this world with you, and what you do to each other and to any being in this world affects them, and thus affects you. We are Nature, and Nature is us. Work towards accepting differences and appreciating all for their purpose, even if it something which does not coincide with our beliefs, opinions and life. We, each and everyone of us, are all entitled to freely live our truth, soul mission, passion & purpose with Ahimsa. This reminds me of the day when my Nana (paternal grandmother) told me how she felt when they had to cut down a tree in their yard which was causing dis-stress to the home. She told me the tree sap was bubbling and pouring out, like the life blood of the tree was bleeding out and she cried and cried for the life of this tree. She respected all Beings and honored this tree with her tears of love & compassion, but also with allowing the wood to help others. I recall my dad taking some for our home to help warm us within the fireplace, and they invited others to do the same. In this way, the tree’s life was useful again. This is Ahimsa. The tree needed to come down, and yet, because it was a living creature, it deserved compassion, respect & loving kindness in both life & death. Using the tree to help others was helping to celebrate it’s life. As we practice Ahimsa more and more, it creates a wonderful energy around us, radiating towards other Beings. It is similar to the domino effect where when we treat others in a specific way, it affects them, and they in turn can treat others this way. Let us create this energy wave each and every day by practicing Ahimsa. It helps create more Unity, Balance, Harmony, Love & Peace in our World. 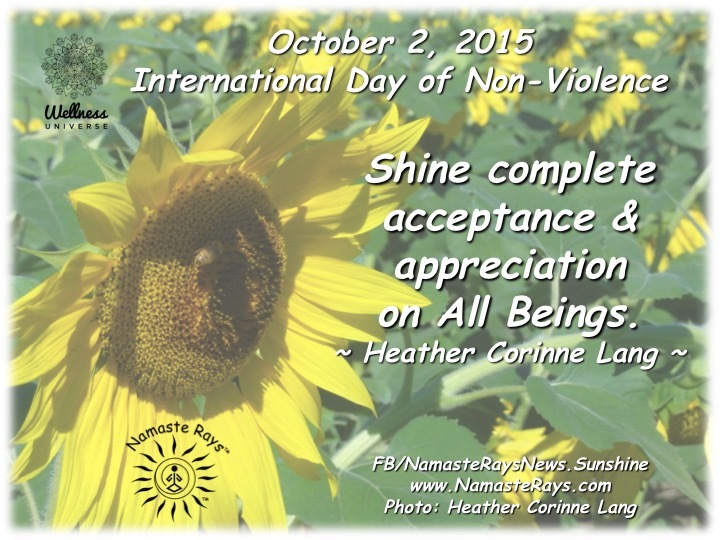 Please visit the link below to The Wellness Universe, where my poster for International Day of Non-Violence on October 2, 2015, is one of the featured posters, among 19 others, helping to spread this principle to the world. Please share or tweet this post or any of the wonderful posters found there to help spread the word.